Did you know that you can make your own cheese! It turns out it’s not so difficult to make a very basic kind of cheese. You basically get some milk, heat it up, add some rennet (explanation to follow), let it sit, drain away the “whey” (that’s the liquid part) from the “curds” (that’s the solid cheese chunks), and presto, you have cheese! Well, as usual, I’m no expert on any subject but I thought I would give it a try. Of course, the internet told me what to do. 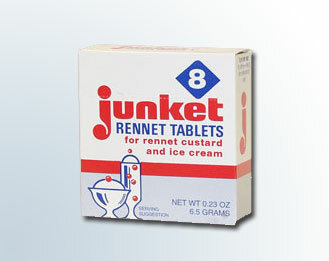 First I had to find these rennet tablets made by a company called Junket. Rennet is an enzyme found in sheep stomachs that makes the milk solidify. I beleive the Junket rennet is produced by bacteria. I couldn’t find any of these tablets anywhere in town so I had to order it off ebay. The Junket tablets came with some handy dandy cheese recipees in the box. I followed the “basic hard cheese” recipee. I used 4 litres of milk and ended up with a hunk of cheese maybe about 1 Kg in mass. 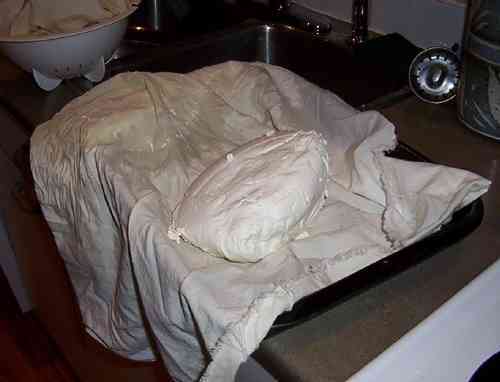 To separate the curds from the whey you need a clean pillowcase to drain it. I just hung it up in the fridge overnight and it drained pretty well. You can also make a cheese press out of an old coffee can. The added bonus is that you can make a little bit of Ricotta cheese from the leftover whey. After that, you throw away the whey. You can eat it right away or you can coat it in wax and store it in the fridge. The instructions said the longer you leave it the sharper it gets. 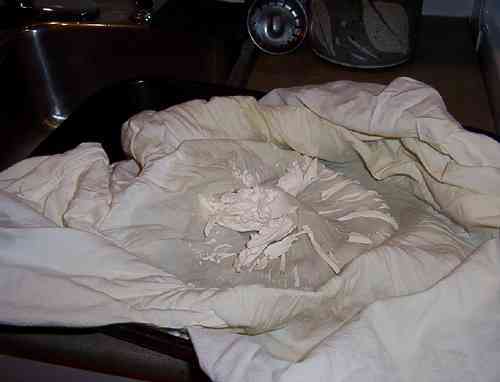 I didn’t have wax so I wrapped it up as tight as I could in wax paper. I will update the blog with the results in a few weeks. This was written by Rob Carrelli. Posted on Tuesday, June 16, 2009, at 10:26 pm. Filed under hobbies. Bookmark the permalink. Follow comments here with the RSS feed. Post a comment or leave a trackback.